In what languages are Church magazines printed? Why does the Book of Mormon say that Jesus would be born in Jerusalem? Brigham Young is probably the man responsible for roadshows (or you might have called them “trail shows” back then). At least he set a precedent when he instructed the Saints traveling across the vast prairie expanses to gather together in the evenings to sing, dance, and entertain each other. He knew that such celebrations could raise the spirits of his people. Today’s Saints are still carrying on the tradition, according to Pat Davis, cultural arts specialist for the General Activities Committee. “I sometimes think we don’t realize what we have in roadshows,” said Sister Davis. “Roadshows are a unique LDS art form, and an exciting showcase for talents. Every would-be composer, choreographer, director, singer, playwright, and dancer has the opportunity to hone skills and try them before the public. Roadshows follow the pattern of Brigham Young’s “trail shows” now that the entire family is encouraged to participate in the productions. Roadshows no longer fall under the jurisdiction of the Young Men or Young Women, but under the local Activities Committee, so they can provide an opportunity for the family to spend more time together. On a weekday evening, dad might be building the sets, mom rehearsing the dancers, a daughter painting scenery, and a son practicing his lines on stage. “One important aspect of roadshows is to get as many people involved as possible,” said Cliff Davis, technical specialist for the General Activities Committee. “Activities chairmen need to make assignments to people who can get involved. Even if someone helps with just a little job, they’ll bring their friends and relatives to see what they did. Some people, however, experience apprehension at the mere mention of the word roadshow. They feel there aren’t enough people to put on a successful show, or they don’t know how to organize a show, or they worry about enough talent and expertise being available. They’ll be happy to know that help is available. A new, in-depth Theatre Manual (stock no. PBAC0089) has been published by the General Activities Committee and can be ordered from the nearest Church distribution center. The manual goes into detail on various aspects of theatre for the ward or stake, including rehearsing, directing, scenery, props, costumes, makeup, lighting, and so on. Included is a special section on producing roadshows. Other sections treat the musical, melodrama, reader’s theatre, variety show, revue, skit, puppet show, and film festival. “Cultural arts specialists for their Activities Committee shouldn’t be intimidated at the thought of putting on a roadshow,” added Sister Davis. “A roadshow is really just a mini-musical. If you think you don’t have enough people, keep in mind that musicals have been performed on Broadway with just two people. There’s no such thing as a branch or ward without enough people to do a roadshow. “If you worry about not having enough talent in your ward for a roadshow, you may be surprised once you start looking. Look for people who have talents, but also for people who are interested in developing their talents in a particular field, like dancing or painting or composing music, then give them that chance. “Evaluate the talent available in your ward. If you’re strong on music and short on dance, then go with a strong musical roadshow interspersed with minimal dance. If you’re strong on dance, go that way. If you have talented soloists, then plan some solos in the roadshow,” said Sister Davis. A stake roadshow activity is initiated by local priesthood leaders on both the ward and stake levels. They communicate their decisions through the appropriate ward or stake council meeting to the activities committee chairman. The stake activities committee chairman then suggests a date for the roadshows, and upon approval includes it in the stake calendar. When deciding on production dates, places, and times, the stake activities committee chairman should consider the particular circumstances of each ward. 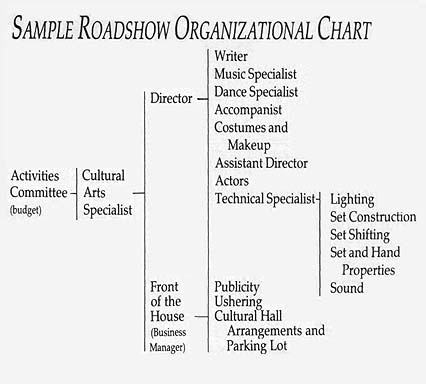 A stake activities committee roadshow specialist should then be called to serve under the stake cultural arts specialist to supervise and coordinate the roadshow event. Under the direction of the stake activities committee, this specialist should then call a planning meeting, at least three months and preferably six months, before the roadshow date. The best way to establish the rules for the roadshows is to hold a stake planning meeting. The stake activities committee chairman should be invited, as well as the stake cultural arts specialist and roadshow specialist. The meeting should be planned at least a month ahead of time. At the meeting, a decision should be made about whether the roadshows should have a “stationary” format, with all wards meeting together in a cultural hall or community facility to present shows consecutively for each other and a single audience, or whether a “traveling” format will be used, with performances scheduled for each show at all the meetinghouses. When this second format is selected, wards do not see each other perform. A separate night might then be scheduled when casts can meet together to receive awards and to perform for one another. Next, rules about judging need to be established. If judges are LDS, they should be invited from outside stake boundaries. Prizes for first, second, or third place are optional. The committee should decide if this is the best approach for the stake, or if prizes should be awarded in various areas such as best script, best dancing, best music, and so on. (That way, there are more opportunities for each ward or branch to get an award.) A “judging clinic” to train judges how to evaluate a roadshow would be very helpful. It’s also a good idea to confirm calendaring at the stake planning meeting. Since all wards will be represented, make sure that the roadshow date does not conflict with ward plans, school activities, or holidays. Another rule that should be set at this time is the length of performance, and whether length is calculated from the time the curtain opens or from when the last group leaves the stage. The number of points to be subtracted when rules are not followed should also be discussed and determined at this time. The next step is for the branches or wards to organize. At the ward level, you may want to invite a member of the bishopric, the activity committee cultural arts specialist, the roadshow specialist, and anyone else who might be involved with the production. At the meeting, plan the kind of show you want and work out preliminary details. Delegate responsibilities to involve as many people as you can. You may want to draw on specialists to help with the script, choreography, music, costumes, makeup, lighting, sets, sound, publicity, budget, and so forth. It’s also a good idea to establish an “apprentice” program, to help train the young people in your ward. An apprentice director or apprentice choreographer can be very helpful; at the same time, the young person will learn skills useful in future shows and in life. Roadshows generally follow a pattern. They’re usually twelve to fifteen minutes long, with a prologue (a short act in front of the curtain to introduce the roadshow), a punchy beginning with lots of action, five musical numbers (about one and one-half minutes each), dialogue that keeps the music going, and a big finale. The first song usually introduces the problem that needs to be solved. The second song usually laments, What will we do? The major song is in the middle and brings out the conflict. The fourth song explains options for resolving the conflict. The final song rejoices﻿—Hoorah! The problem is over. The pattern is not rigid, of course. The opening number of the roadshow should have enough energy, movement, and vitality to gain the immediate attention of the audience. Each line of a song should be blocked and planned down to the most detailed gesture so the chorus does not repeat the same action over and over, or appear awkward and unrehearsed. The middle portion of the roadshow develops the conflict through music and dialogue. The climax occurs when the two opposing forces meet in collision. After the conflict is resolved, the finale brings everyone on stage for lively singing and dancing. There’s lots of movement on stage, and everyone rejoices that the problem has been solved. In writing the roadshow, avoid long lines of dialogue, which can bog it down. Dialogue should be short and snappy, because there really isn’t enough time to develop characters, as there would be in a drama or full musical. It’s also important to base roadshows on wholesome values, and not to mimic the immoral or less-than-uplifting attitudes and styles often portrayed on television or in the movies. At the same time, sacred topics should be avoided, so as not to trivialize the sacred aspects of the gospel. Roadshows should generate the positive value system that we as church members espouse, while at the same time not becoming didactic or preachy. It’s a good idea to hand out the rehearsal schedule at the first meeting with the roadshow participants. Some wards where members live near each other have scheduled rehearsals early in the morning, before work and school. Others have scheduled rehearsals during the evenings and on Saturday mornings. ﻿—Begin rehearsals six weeks before the performance date. ﻿—Know exactly what you want to accomplish at each rehearsal. ﻿—Be prompt, have prayer, and begin on time, even if only one person is there. ﻿—Keep your cool, even through frustrating times. ﻿—Expect the cast to work without the script at a specified time. Be kind, but firm. ﻿—Allow adequate time for polishing the roadshow. ﻿—Remember, you are influencing lives and teaching the gospel as well as directing a show. Use variety in your staging. Different levels made from stools, ladders, boxes, or platforms create an interesting stage picture. You can vary the level with actors, too, by having people lie down, kneel, sit, stand, or sit on someone’s shoulders. Make entrances and exits different each time, and plan them carefully. Remember that if people are on stage in the background, they should not just stand there, but should be a part of the scene with planned movement or gestures. Music need not be original for a roadshow, although it offers more opportunities for creativity if it is. You may even want to mix some traditional songs along with songs written specifically for the roadshow. Published music from a play or movie may be used if you don’t charge admission and as long as you are not producing all or part of the original play. Words to such music may be changed, again, only if you are not producing the entire play. When planning for sets, lighting, and sound equipment, keep things simple and portable. “Whatever you build for sets, be sure it works for each stage you will be traveling to,” Brother Davis said. “Take the measurements of the smallest stage and build to those dimensions. It’s best to use hinged flats stretched with muslin (see the new Theatre Manual for instructions on how to make them). You can fold them up quickly, and they’ll fit through chapel doors easily. If your ward is not strong on artistic talent for painting the flats, one way to paint the scenery is to take a picture from a magazine, project it from an overhead projector onto the flat, and trace the photo. Then you can paint by number, recruiting help from all ages, and have the most artistically inclined road-show volunteer put the finishing touches on the scenery. (See the Theatre Manual for more information on painting scenery.) One last caution﻿—don’t use corrugated cardboard for scenery. It warps, and the corrugation shows when it’s painted. It’s also a fire hazard. Some of the best sound experts in the ward might be stereo buffs, often teenagers who have their own sound equipment. You may want to recruit them as experts in setting up the sound system for the roadshow, making sure it will be portable if you take the production from building to building. The most successful roadshows are those with enough polish to make them run smoothly and easily. Score each roadshow for each category, noting maximum points allotted. Deduct 10 points for overtime. NOTE: In case of a tie for first place, each judge revotes—scoring only those shows involved in the tie. Kathleen Lubeck, manager of the Magazine Features Division, Church Public Communications Department, is a member of the General Activities Committee.